Developer Grezzo is all-too-familiar with the Nintendo 3DS, having been responsible for convertingboth Ocarina of Time and Majora’s Mask to the system. Needless to say, Ever Oasis feels inspired in part by those Legend of Zelda titles. But the homages don’t really stop there. 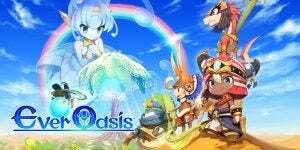 Ever Oasis feels like the amalgamation of countless other games that have come before, but not necessarily even from within the same genre. There are city manager, dungeon crawler and action RPG elements all thrown together into a melting pot that makes for a diverse, if not occasionally a little convoluted, experience. Fortunately, what really ties Ever Oasis together is its charming world and cast of characters that make you feel rewarded and motivated to continue playing. One minor complaint from the initial stages is that it starts a little slowly, with lots of cutscenes and exposition. The game begins with some scene setting out in the desert, introducing you to your main protagonist named Tethu. He or she – there’s a basic character creator – is a cute-looking desert dweller living with their elder brother, a chief of a bustling oasis. The game reveals that a great threat to the world’s oases exists, known as Chaos, which transforms its inhabitants into monsters and generally ruins the rather tranquil mood. Unfortunately, Chaos reaches your desert home and your elder brother is immediately lost to the menace, throwing your world into turmoil. It now falls upon you, as a Child of the Great Tree, to form a new oasis somewhere with the aid of a water spirit. Here then your adventure really begins by developing your own oasis from a population of zero (excluding yourself and your friendly water spirit friend who can’t leave) to a bustling hive famed throughout the land. The oasis part of Ever Oasis plays rather like Animal Crossing in the sense you have visitors and residents you want to keep happy. Keep them happy and they’ll open Bloom Booths, fancy shops that sell all manner of wares, and these in turn attract more visitors and shoppers. The thing is, in the early hours of the game you’re responsible for keeping the Bloom Booths stocked with whatever they need, be it fruit and vegetables or materials to make scarves and the like. The life of an oasis chief is very hands on in this world. Later in the game, you can delegate some of your responsibilities. In fairness, you do get a cut of the profit, known as Dewadems. This currency can then be re-invested into more Bloom Booths or upgrading your equipment. It’s worth talking to the visitors to your oasis, too, as you’ll often hear rumours of other potential oasis recruits out in the main desert. The game progresses through a day and night cycle, and there’s a genuine feeling of joy when people you’ve met while out exploring follow through on their promise of visiting, or all-new visitors come by out of the blue. They’re often accompanied by shopaholic tourist ‘Noots’ who never become actual residents but will deliver some tidy profits. As you acquire more residents and keep them happy, your oasis will level up, growing in size and capabilities. Leave the safety of your oasis and the game completely changes. Outside of your safe zone the the camera perspective moves from its fixed position and the game introduces combat, where you have to take on Chaos-possessed critters. The combat, however, is very basic and unfulfilling. You essentially have a heavy and light attack and the ability to roll and dodge extremely telegraphed attacks. You can target your enemies using the L shoulder button, much like in Zelda. Combat never feels particularly challenging, aside from the occasional moments where you take damage rather cheaply. Later in the game you can recruit up to two others into your party and they’ll wade in with attacks controlled by the AI, unless you swap to them by cycling with up and down on the D-pad. When under the control of the AI, they’re more likely to take damage, which is a little annoying. Different character classes deliver stronger damage to different types of enemies, which does add a little more strategy. Still, the combat feels more like a slog than a major part of the game. Once you’re back at your oasis, your characters earn XP for enemies defeated, so it’s still best to take them on even if it isn’t necessarily that fun. There’s another use for having multiple party members. Each member has a special skill, such as digging, transforming into a rolling pellet or the pulling of levers. This opens up Ever Oasis to puzzles in a similar vein to a game like Trine or, looking further back, The Lost Vikings. This makes the dungeon exploration a far stronger element than the lacklustre combat. Wandering around the ever-expanding map is satisfying, as is solving some of the more head-scratching puzzles within its dungeons. These can sometimes require you to swap out party members back at the oasis but fortunately, the game does a great job of offering lots of quick warp points to save you backtracking. Finding new areas of the map and traversing its dungeons emulates the sense of wonderment from The Legend of Zelda, which can only be a good thing. Finally, a nod should be given to the game’s score, which perfectly captures the feel and tone of a desert-based title. Think Lawrence of Arabia and you’ll be on the right (sand) tracks. This combined with the visuals makes the world of Ever Oasis irresistibly charming. You could also argue there’s a rather heartwarming message about characters from different races and creeds all living together in harmony tucked away beneath the cutesy facade – and that’s something I’m sure we can all get behind. Ever Oasis is a tricky game to describe succinctly. Combining multiple different game styles into one is no easy task and, for the most part, Ever Oasis does an admirable job of at least coming close to achieving its lofty ambition. There’s so much to do it can feel a little overwhelming at first but the game does a great job guiding you through, especially for younger gamers. It’s not quite the sum of its many parts, the combat in particular begins to feel like a chore, but otherwise Ever Oasis is a real diamond in the rough late in the life of the Nintendo 3DS. The post Ever Oasis Review appeared first on Trusted Reviews.